Morey’s Piers & Beachfront Waterparks continues to shake things up on the Wildwoods, NJ, boardwalk this summer with the introduction of live musical entertainment and new flavorful food offerings. 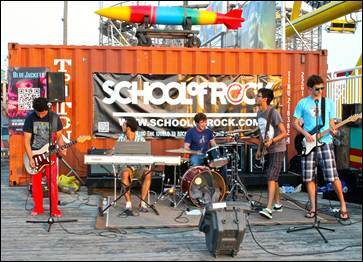 Throughout the remainder of the summer, top bands from School of Rock, a performance program for young musicians ages 7-18, will showcase their talents at artBOX, the new 10,000 square foot interactive artists’ colony crafted from 11 re-purposed shipping containers on Adventure Pier. School of Rock groups from around the New Jersey and Pennsylvania area will perform a variety of music genres from Rock n’ Roll and Indy Rock, to a playlist of original songs. Shows take place in the evening; for a list of scheduled performances, visit www.moreyspiers.com/schoolofrock. Wrecker’s Beach Grill at Raging Waters Waterpark on Mariner’s Landing Pier is now open to the public with an easy-to-access, beach-front entrance. Waterpark admission is no longer required to enjoy the grill’s variety of summertime favorites including hotdogs, cheesesteaks, fries, wraps and more. Beach-goers looking to satisfy their sweet tooth will get a taste of France with the new homemade crepes and donuts available at La Bakerie, also located on Mariner’s Landing Pier. On Surfside Pier, guests can unwind after a long day in the sun at the new seated bar area on the covered, second floor of Joe’s Fish Co. The acoustic sounds of local musician “Spin’s Nightly” can be enjoyed at Joe’s from 7pm -11pm on various dates through the end of August. In addition to serving up lively libations, great food and open-air ocean views, the new Soggy Dollar at Ocean Oasis Waterpark (also open to the public) features a rotating cast of fresh young, talent including Tommy Ciccone, John McNutt, Eric Eden, Brian London and more, performing daily from 2pm-6pm. Also new to Adventure Pier this summer is Tokyo 4B [the ART of Sushi], a café serving a variety of fresh sushi. Menu items include Seared Ahi Tuna, California Rolls, Spicy Tuna Rolls, and specialties such as the Ocean Roll featuring spicy crab meat topped with lobster.